A group of former rebels in Libya says it has "arrested" the country's prime minister. On October 10, Ali Zeidan was reported seized by armed men from a Tripoli hotel and taken to an unknown location. The Operations Cell of Libya's Revolutionaries said on Facebook that Zeidan was arrested "on the prosecutor's orders," without elaborating. A spokesman for the group, meanwhile, was quoted as saying Zeidan was seized because of his government's role in the capture of a top Al-Qaeda suspect by U.S. forces in the Libyan capital on October 5. 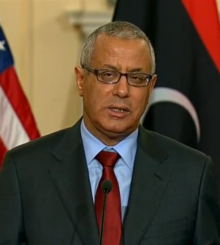 The government said in a statement earlier on October 10 that Zeidan was seized by armed men for "unknown reasons." Libyan authorities have been struggling to contain rivalries between armed factions following the 2011 civil war and killing of former dictator Muammar Qaddafi.